I had myself at wine and in order to get it I had to listen to that little devil on my shoulder and add some personality to this blank slate so of course a basket gallery wall was in order. 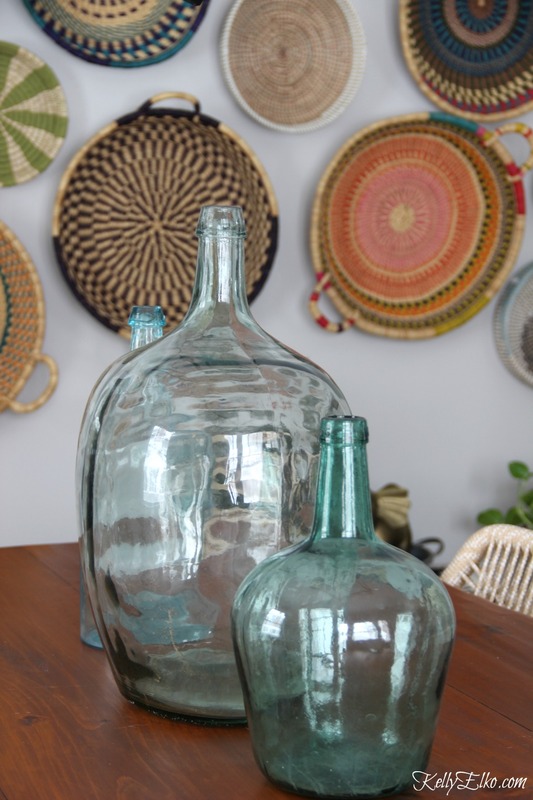 I love collecting things slowly over time but an instant collection isn’t a bad thing either! These baskets called to me from the HomeGoods clearance aisle so I decided to give them a good home. 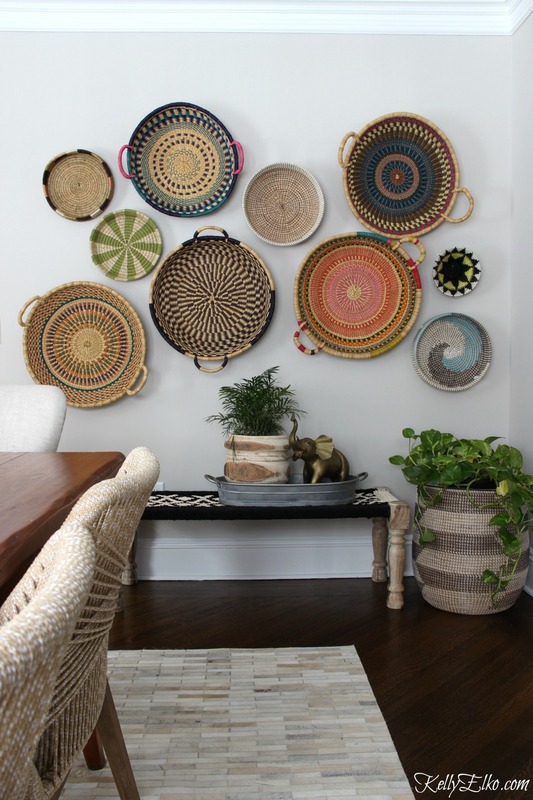 They are hand woven African baskets from Ghana (except the blue one on the bottom right). 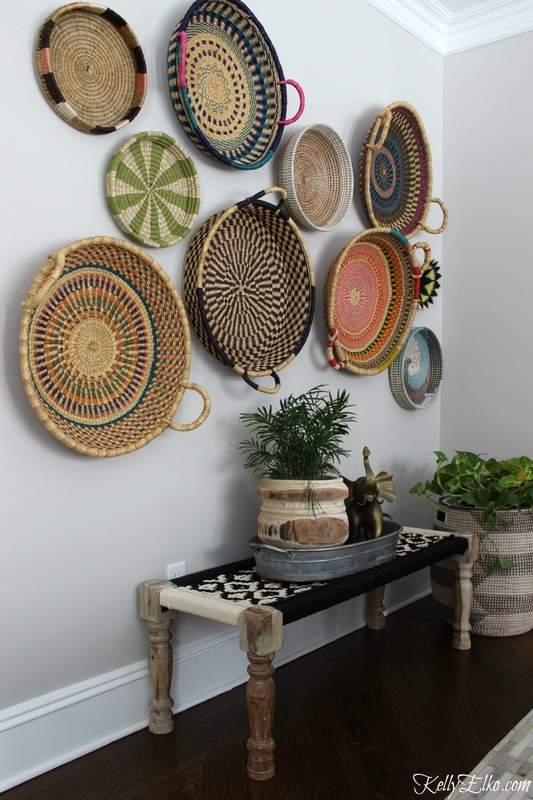 You can find a great selection of African baskets HERE or get a similar look by scooping up thrift store baskets. I moved my favorite woven bench from my foyer (get the bench on sale HERE). I love these hooks for hanging the baskets. Just poke the hook right through the basket. Bonus – no holes in the wall! 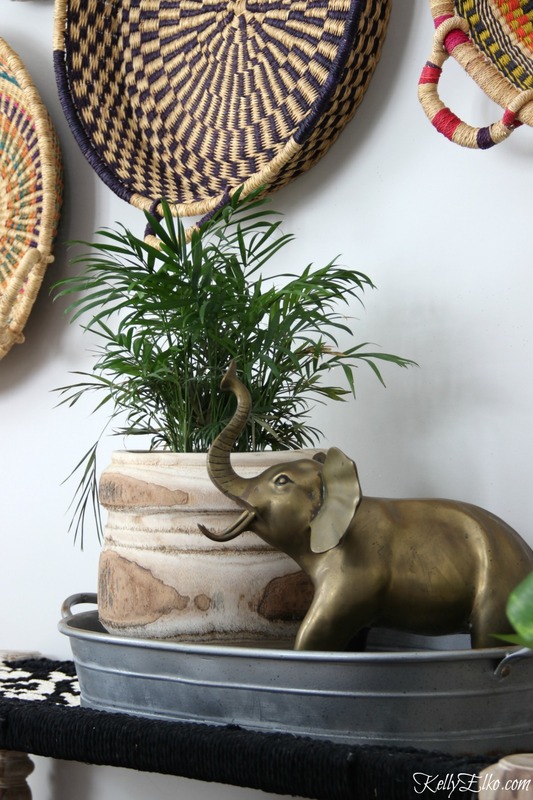 I just realized my vintage brass elephant will feel right at home among these African baskets! My dining room is right off my foyer so anyone who comes through my front door will be greeted with this colorful wall that shows off my personality. Changes galore have been happening in this room … so long curtains and my pine hutch that I sold on Facebook (see how I sell my unwanted stuff on Facebook HERE), wood wine cubbies are no more and my metal cabinet moved to the other side of the room (whew, I do need that wine). Plus one of my dining chairs broke (it’s not the first time but this time it’s unfixable) so I’m on the hunt for replacements. What a great wall and that bench and elephant are perfect. You are truly amazing and sometime we need another tour to see all you have done. Yes I need to do that Marlene and soon! I love it-“you’re not a monk” !!!! But I do have an uncle that was a Jesuit priest! Kelly! 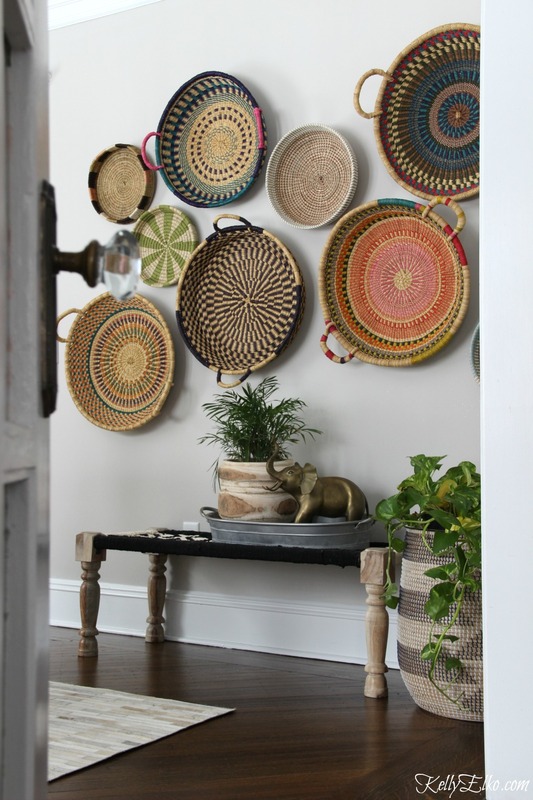 Your basket gallery looks fabulous! I love the texture and color it brings to the wall without being overwhelming! Your bench and the vignette with tray, plant and precious elephant are delicious icing on your creative project! Thanks so much Judy – I’m loving all the color! What a wonderful Wall. 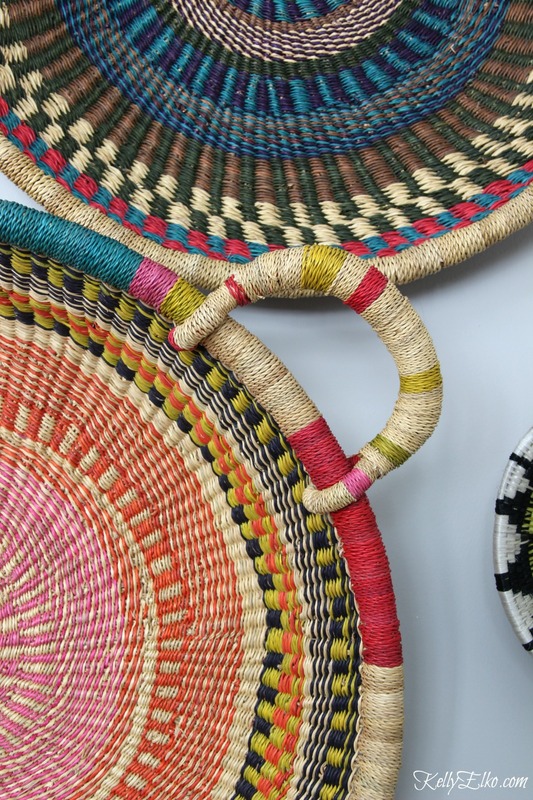 The colors in those baskets are so bright and fresh. Love the bench with these. Thanks for sharing. Thanks Hope and happy 2018! Very cool Helen – sounds like you need your own elephant! What a beautiful wall you created! Congratulations!